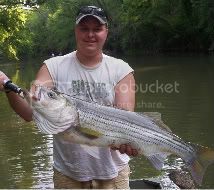 STRIPER SOUP :: View topic - USGS River gauges? Posted: Mon Jun 14, 2010 7:45 pm Post subject: USGS River gauges? I check two gauges on a local river pretty often and there is a 236 CFS difference in the gauges. It is 236 CFS higher at the upstream gauge than the lower one and the upstream discharge has not changed in two days. Could that much water be getting drawn out of the river. There is spot on the river between the two gauges where water is withdrawn. Normally the lower gauge has a higher CFS reading than the upper one. Sounds like a gauge problem, but they check them pretty regularly so they should get it fixed soon. That's way more water than any single treatment plant in GA can handle. Fulton County has 2 small lakes that they draw from and they often have to pull water from the Hooch to fill them, so if you are talking about the Hooch near ATL then possibly it could be right, but 236 cfs is a lot of water and I doubt even Fulton Co is using near that much.